As the recession continues and everyone seems to have tighter budgets we have spent many months developing smaller items many of which would make ideal gifts especially for Christmas. All the items offered are made entirely by us here at Fox Country Furniture to the same exacting standards as our larger bespoke items and are only available from us. These smaller items are all suitable for delivery by post. 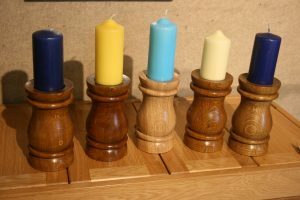 These oak candle sticks make an excellent Christmas gift.Cost for a pair is £45 with candles, or £25 for one. They are designed for 60mm candles.Available with festive green or red also. Colours from left to right are; medium, Victorian, natural, medium, light, all in oak. Our personalised oak stools are a great gift for any occasion or time of year. Mostly given as christening gifts, they can also be ordered for weddings etc. 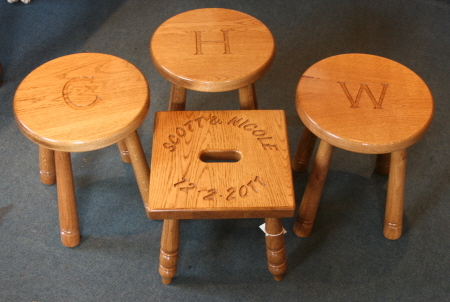 Round 4 leg stools or our square footstool can be inscribed with names and dates or single initials as shown. The usual range of colours is available. Square stool £85, round stool £65. Order early for Christmas delivery. 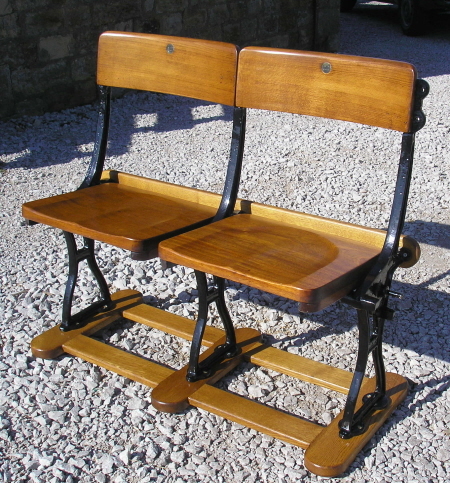 These beautifully restored Stoke City Victoria Ground seats make a perfect gift for any commited Stoke fan……or anyone who has a space in a hallway or conservatory. Carefully restored to retain the character of these original Victorian seats whilst creating a stunning focal point for any room. The seats and backs are original, the cast frames are also original, sand blasted and painted for a deep gloss black shine and durable finish. These little gems make a perfect gift for almost anyone. Measuring 105mm high x 85mm wide x 50mm deep, they will happily sit on the smallest shelf. Available with a rounded or square top in a variety of timbers. Each one is carefully finished to our highest standard and has a hand carved Fox head on the back. Available from Longnor Craft Centre. They are great value at £19.95 with P + P at £5.00. Please order in good time for Christmas. 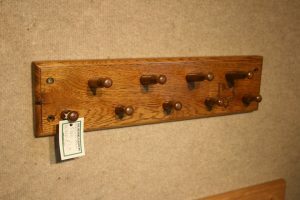 Our range of Coat peg boards starts at a 3 peg which is 12” long up to a single row of 8 pegs at 32” or this double row 9 peg at 20” x 5”, prices from £19 to £38. Specials can be ordered. 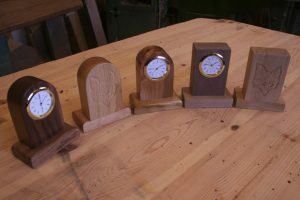 A selection of our hardwood clocks. This is where our clock range started. Measuring 4” to 5” diameter, available with Roman or Arabic[normal numbers] faces, prices range from £26 to £39 for highly figured local ash or elm. If you are looking for a gift with a Peak District connection, the items made from local timber are part of our ‘Born and raised in the Peak District’ range of small items and come with a certificate showing where the tree grew.